This is the weekend that we are supposed to honor the memory of Dr. Martin Luther King. For most of the lamestream media the holiday provides the opportunity to depict Dr. King as a benign figure who might have stepped out of a Hallmark card. What they stress is the fight for racial equality — undoubtedly a laudable aspect of his legacy and certainly worthy of celebration. What they often fail at (or at least downplay) is Dr. King’s challenge to this country to be aware of and correct the economic inequalities that has harm both black and white Americans. 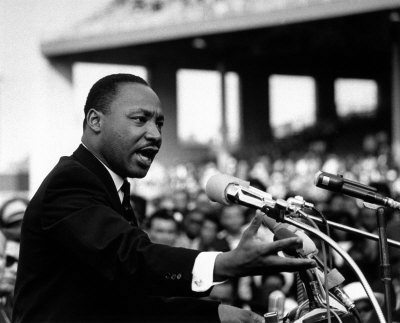 In opposing to the Vietnam War, Dr. King warned us that, “a nation that continues year after year to spend more money on military defense than on programs of social uplift is approaching spiritual death.” If he had lived to become an old radical activist, I believe he would never have become so acclaimed. His ongoing opposition to continuing injustices and unnecessary wars would have made him a pariah, scorned in the media and the hallways of power as a crank or extremist. Surely the media would have dragged his sometimes tawdry personal affairs out in to the open, inciting scorn and cynicism via “gotcha” quotes from “respectable” establishment leaders. Surely, much more would have been made of his past interactions with Communist Party members, forgetting that, until very recently in US history, they were among the few organized groups actively opposed to segregation. Today, no doubt, his relationships with unions and organizing poor people would be cast as the acts of an evil subversive. The All Peoples Breakfast, on Monday, January 17th, headed into its 23rd year as a time for San Diegans to remember the legacy of Dr. King has selected “The Media and the Movement: From apathy to activism, media as a force for social change” as the theme for this year’s event. I will be joining with other community bloggers on Monday morning from around San Diego to report on the event, live (via Twitter) and after the fact. Our observations will be reposted at the Voice of San Diego, whose evangelism about spreading the good word via social media has made a real impact in the community, especially with the student groups that they have encouraged to break away from dead-tree journalism. You can follow us on Twitter by searching the hashtag #Allpeoples. (For those of you unfamiliar with Twitter, no, you can’t smoke a hashtag). I’ll have a follow up report the day after the event here at the OB Rag. And in his honor we should never become silent about things that matter. And, whew, are there tons of things that matter in this world. Well, got things to do as I am not looking for my life to begin to end – especially not on a beautiful Southern California day like today. Martin has been on my mind quite a bit of late. Oops, I hit the submit button before explaining one of the reasons Martin has been on my mind of late. My mother died on his birthday in 1975. I didn’t know that at the time as there was no holiday for him back then. There is a direct connection between Martin Luther King and San Diego independent media. Unfortunately, it has to do with his assassination on April 4th, 1968, not his birthday – which we are celebrating now. But in early April of ’68, after his murder, student activists at UCSD joined together with some faculty and grad students and formed the Tuesday the Ninth Committee – to better coordinate anti-war efforts as well as anti-racism education. TNC formed into smaller groups, some collectives. One such collective moved off campus to become “more relevant” and they formed the San Diego Free Press collective which started publishing first the SD Free Press and then the San Diego Street Journal – San Diego’s first underground newspapers. And a few of us were so inspired by the Street Journal, that we started the original OB Rag in the Fall of 1970. This may come as a surprise to some, but I didn’t know that story. And I even was a contributor to the Street Journal. ~ Had MLK lived, we’d be living in a completely different world than the one we live in today. Your statement & essentially the whole article for that matter, is written from a perspective this is presuming that MLK never would’ve accomplished anything had he lived, and that no matter how hard he fought and spoke out against injustices, nothing would have changed. When nothing could possibly be further from the truth. The reason MLK didn’t live is because he was a true Revolutionary. He backed all his talk right up until the day he was assassinated. MLK lived revolution. He had the fight in him, & that’s what the powers that be were so threatened by. ~We’d be living in a much better world today, had MLK lived. ~We wouldn’t be fighting this senseless war today, had MLK lived. ~Washington wouldn’t be the corrupt political nightmare it is today, had MLK lived. ~We’d still have honest journalism, had MLK lived. These few things are just the tip of the iceberg though. There are many more tragedies/circumstances that I don’t believe would’ve ever happened/existed had MLK lived. The cynical tone with which this whole article is written is not at all in the spirit of MLK. There is no hope & faith to be found in it, and everything MLK did was done with the strongest of convictions because he had faith. He had hope, and he knew that he could make revolution happen. There’s no comparing MLK to the “mouth-piece radicals” we have today. There will never be another MLK. I listened to MLK’s Nobel Peace prize acceptance speech in 1964, in which he stressed the non-violent aspect of his efforts. Fast forward to 2011. There are now 90 guns for every 100 people in this country. We are being exhorted by the right to arm even more- faculty on campuses, congress people, etc. Is “non-violence” relevant anymore? How do you reconcile non-violence with gun ownership? If I don’t actually use my glock and ak47 and extra magazines and cop killer bullets, can I still be a person of peace? I am feeling dazed and confused.